In the Grand Ballroom at Hyatt Hotel in Canberra, Saudi Ambassador to Australia and New Zealand H.E. 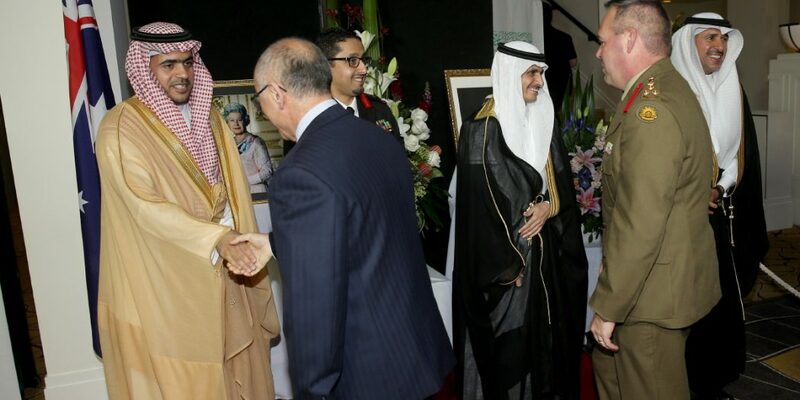 Nabil Al Saleh held a reception to mark Saudi Arabia’s 86th National Day in Canberra. The reception was attended by Ms Lyndall Sachs Chief of Protocol at the Department of the Premier and Cabinet’s Protocol Branch in Canberra, a number of senior political and parliamentary figures, Australian Foreign Affairs officials and representatives of other Australian ministries, as well as ambassadors accredited to Australia, representatives of Arab and Islamic associations and centres in Australia, academics from Australian universities and Saudi scholarship students. The guests were received by Ambassador Al Saleh, Deputy Ambassador Meshaal Alrougui, Military Attaché Colonel Sami Al Mutairi and Cultural attaché Dr. Abdulaziz Bin Abdullah Bin Taleb. The ceremony started with the Kingdom’s royal anthem and the official anthem of Australia, followed by exchange of greetings. Tom Harley the Chairman of the Australia Saudi Business Council delivered a speech expressing his congratulations on the Kingdom’s National Day. 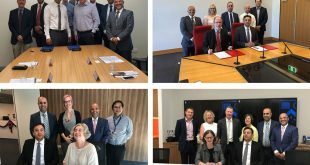 He also commended the Saudi Arabia’s Vision 2030 and its promising economic and commercial opportunities for Australians investors. Ambassador Al Saleh, in his name and representing members of the embassy, Saudi Arabian Cultural Mission and scholarship students, raised congratulations to the Custodian of the Two Holy Mosques King Salman Bin Abdulaziz Al Saud, H.H. Crown Prince and H.H. Crown Crown Prince on this occasion, praying to Allah to sustain the blessings of security, safety and stability for the Kingdom and its people. Mr. Al Saleh also highlighted the advantages and opportunities offered by the kingdom’s Vision 2030 projects. 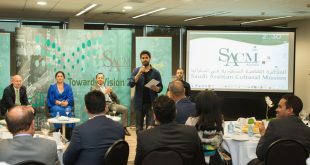 He said that the Vision’s three themes (Thriving Economy, Vibrant Society, and Ambitious Nation) serve as a roadmap for the Kingdom’s developmental and economic objectives, including extensive plans and ambitious economic, social and development programs which aim at preparing Saudi Arabia for the post-oil era. He also indicated that one of the Vision’s goals is to enhance the Saudi economy to move it from rank 19 to rank the 15 world widely. Ambassador Al Saleh further stressed that the Kingdom will remain attractive to investors, Australians in particular, highlighting the role of complementary private sector in achieving the Vision 2030 and the opportunities it offers, especially in defence industry, health, education, mining, infrastructure, services and technical information, food security …etc. 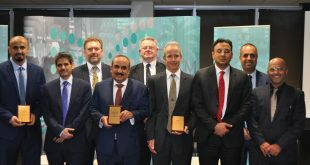 He encouraged companies and businessmen in Australia and New Zealand to establish constructive trade and economic partnerships with the Kingdom, as this will contribute to increasing investment and commercial and economic exchange between Saudi Arabia and Australia in all fields. H.E. Ambassador Al Saleh honoured the Saudi Cultural Attaché to Australia Dr. Abdulaziz Bin Abdullah Bin Taleb on the end of his commission in Australia. H.E. Nabil Al Saleh, accompanied by the Australian Chief of Protocol Ms Lyndall Sachs and the rest of attendees, toured the ceremony’s exhibitions including the Military Mission’s exhibition which reflected the Kingdom’s efforts in the fight against terrorism, humanitarian relief. They also visited the Saudi Arabia’s Vision 2030 exhibition, and the Saudi heritage tent, where coffee and dates were offered by embassy members and a number of Saudi students. Information and documentaries about Vision 2030 were displayed, and publications about the Kingdom’s heritage and current civilization issued by the Saudi Commission for Tourism & National Heritage were distributed to visitors. Following the dinner banquet, scholarship student Badr Al Say’ari delivered a national poem. Thereafter, H.E. 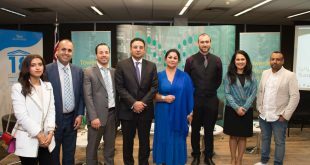 Ambassador Al Saleh and the Cultural Attaché honoured the presidents of the Saudi Student Clubs in Australia and some outstanding students.